It took me some time to scout out the best places to snorkel in the BVI. What kind of tour guide would I be if I didn't tell you where the best spots in and around the island are located? I've talked with my resident dive expert Keith Royle of Blue Water Divers (BWD). The folks at BWD can hook you up with some gear and can even be your guide. If your interested in getting the right underwater experience BWD can help, just fill out this form below. For now though, let me tell you where the best snorkeling in the Caribbean could be found. 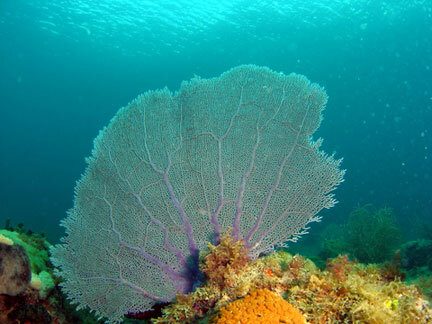 Tortola and it's surrounding islets have some truly breathtaking underwater sea life. In fact, with so many coral reefs and an abundance of ship wrecks it's no wonder why so many visitors make this their Caribbean snorkeling destination. Couple that with calm winds and crystal blue waters and you've got a recipe for an amazing adventure. There's a host of sea life just waiting for you and your flippers here. So check the weather, rub some sunscreen on your backside, and put the mask over your head. I'm about to show you the spots that are not to be missed! Unfortunately, there are only two really good spots that I have found on the coast of Tortola. They both offer something unique and different so don't hesitate to visit them both. Please don't get discouraged by hearing that there are only two spots on the island. There are tons of other sites to discover just off the island, you'll have to use Tortola as your jumping off point. Smugglers Cove is a great place for snorkeling beginners. The water here is super shallow, and you can literally reach out and touch the angelfish as they swim just beneath your hands. Swim out to the left side of the beach (it's only the left side if you're looking out towards the water) towards the point. 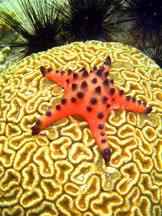 There you will find some of the best underwater life on the Tortola coast. Northeast of Smugglers Cove you will find the most well known snorkeling spot on the island at Brewer's Bay. Last time I was here, I had so much fun I accidentally swallowed a little too much saltwater. Anyways, this is known as the best spot on the island to snorkel. 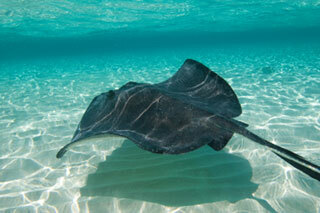 There's plenty to do and see at Brewer's Bay, over the years I've seen everything from large stingrays to sea turtles. It always amazes me how much faster turtles move in the ocean as opposed to on land. I like Brewer's Bay because of the different levels of ocean floor. These different levels form an underwater alleyway, where you'll find some amazing coral formations and even a lobster or two. If you really enjoy traveling the globe in search of seeing new and interesting things, then taking a short boat ride just outside of Tortola can provide you with an exciting new experience. Some of the best Caribbean snorkeling can be found just off the island. In fact there are quite a few excellent snorkeling locations that will leave your backside sunburned for days on end. The worst part of it will be that you'll never want to stick your head above water, because there's just too much to see. Which in my opinion is a great problem to have. 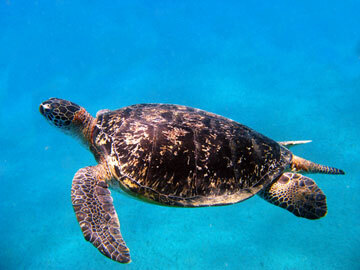 Almost all of the best places to snorkel reside just South and Southeast of Tortola. These spots reside on the coastlines of Norman, Peter, Cooper and Salt Islands. There are also quite a few sites located in The Dogs (a group of small islands to the East of Tortola) and a couple of sites just off the shores of Virgin Gorda. If you're wondering where all of these sites are located, don't worry I've put together a diving map to show you where to find these places. Nestled between the famous Baths and Spanish Town (Virgin Gorda) lies The Aquarium. Having a close proximity to the Bath's, you'll see boulders and rocks piled up all over the sea floor. There's some amazing vertical coral formations, sponges, lobsters, and possibly a nurse shark. South of Manchioneel Bay off Cooper Island you can find Cistern Point. Cistern Point is one of the better shallow snorkeling sites around the BVI, with a rocky sea floor and some small underwater alleys. The sea life here includes gray snappers, angelfish, and goatfishes. If you're looking for some brain (coral) then make sure to stop at Coral Gardens. Located Northeast of Dead Chest Island, Coral Gardens offers onlookers jawfish, sea fans, barracuda, snapper, and of course brain. Please be advised to only snorkel Coral Gardens on very calm days. This place is also an excellent scuba destination. 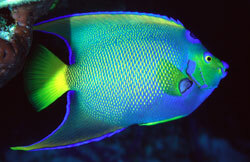 Diamond Reef hosts a swell of parrotfish, garden eels, and some interesting coral. Diamond Reef is located just off the East end of Great Camanoe. This is a good site for both snorkelers and divers alike. It's always an adventure visiting Spyglass Wall. The top of the wall is a wonderful snorkeling adventure with sea fans and houndfish. To visit the walls base your gonna need some scuba gear. At the bottom of the wall divers can enjoy massive sea turtles and even stingrays. Vanishing Rock gets it's name because the rock disappears most of the time, unless the tide is low. Vanishing Rock sits between Salt and Cooper Islands in a narrow passage that attracts scores of fish. Some of the "Rock" highlights include a variety of corals, shrimp, squirrelfish, and maybe a nurse shark or two. 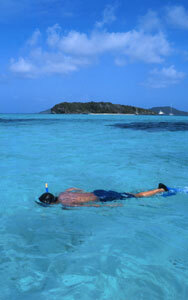 As you can see there is plenty of great snorkeling spots all over the BVI. Tortola is the main jumping off point for some of the best places to snorkel in all of the Caribbean. If you need some equipment or even a guide to show you around try out Blue Water Divers. There is a form below to contact them. Please remember all of these snorkeling sites are not only for snorkeling enthusiasts. Scuba diving fans can also have a great time at all of these sites. In fact, scuba diving allows for so much more freedom in exploration, if your interested check out our scuba page.